Regions Hospital developed a clinical practice guideline for solid organ management in 2002-2003. It has been revised a few times over the years, as any good guideline should with the availability of new data. 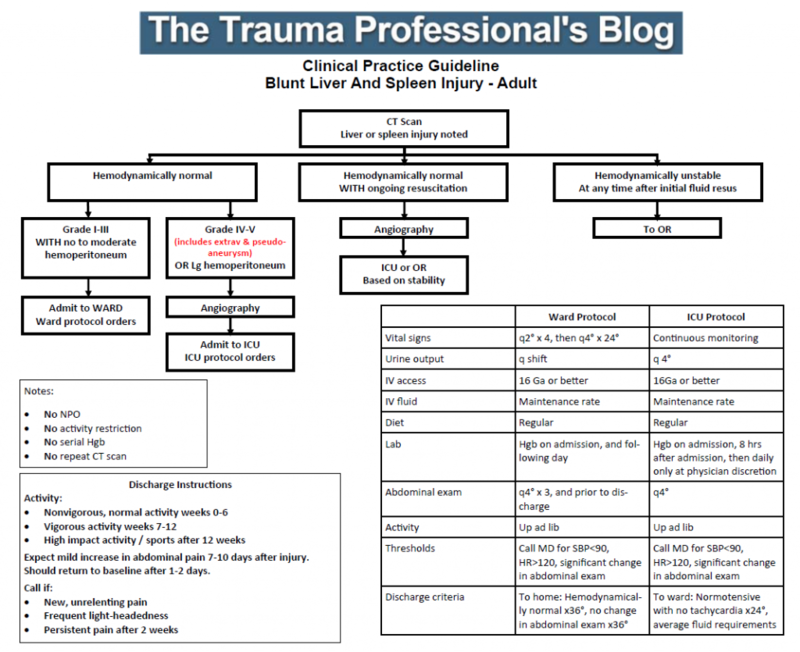 I’ve just put the finishing touches on the latest revision as a result of the updated organ scaling rules published by the American Association for the Surgery of Trauma. I reviewed the new scales for both liver and spleen earlier this year (links below). In the previous iteration of the scaling system, the importance of contrast pooling (pseudoaneurysm) or extravasation beyond the organ was not well defined. The new guideline explicitly includes these injuries in the high grade group, which for us is grade IV or V. Technically, pseudoaneurysm of the liver is only grade III, but in my opinion demands angiographic investigation and embolism. Thus the inclusion in the high grade / angiography arm of our guideline. These changes were made in 2015 based on our clinical experience that properly selected patients almost never fail. And they still don’t, so why starve, restrain, poke, and re-irradiate them? Additionally, we included explicit impact activity restrictions for post-discharge so that patients would get the same message from all members of our team. Click the image below to download the guideline and have a look. I’m interested in your comments! APSA Activity Restrictions After Solid Organ Injury: Aren’t We Done With That Yet? Nearly 20 years ago, the American Pediatric Surgical Association (APSA) published a clinical guideline for management of solid organ injury in children. Part of the guideline included activity restrictions, specifically for a period of time after injury. This was generalized by many clinicians to include a period of in-hospital bed rest. A paper has just been published that examines the usefulness of restricting activity in pediatric patients with solid organ injury. It was authored by a consortium of 10 Level I pediatric trauma centers, and included all patients through age 18 who did not have a concomitant significant renal injury and no pancreatic injury. All injuries were diagnosed by CT scan over a 33 month period. Activity restrictions were given to all patients upon discharge, which limited sports, wheeled recreational activities, and anything else requiring two feet off the ground. A phone survey was conducted 60 days post-discharge to judge compliance. Unplanned return to ED, readmission, and complications were also assessed. A total of 1007 patients were studied, and 99 were excluded due to concomitant pancreatic or high grade renal injury. An additional 79 were excluded due to missing injury grade or operative management. 279 claimed to adhere to activity restrictions; 13% returned to the ED and 6% were readmitted. 49 admitted that they did not pay attention to the restrictions, and only 4 (8%) returned to the ED. None were hospitalized. Bottom line: Due to the nature of this study (specifically the phone survey component), there will be degradation of the data. Some patients do not want to admit that they didn’t follow the doctor’s orders. In theory, this could increase the number of complications / returns to ED in the “compliant” group. But it did not. The other issue I have with this study is that it was not stratified by age. The spleen of an 18 year old is very different than that of a 6 year old. Sixty years ago, we used to take spleens out in adults with a diagnosed injury. The reason we moved toward nonoperative management in adults was the very favorable experience we had in children. Unfortunately, nowhere in this paper is age broken out. Typically, the number of older children (who are really adults) with the injury far outnumber the younger ones, which also tends to increase the number of complications seen. But once again, we did not. Small numbers? Possibly. So what are we to make of all this? Basically, it tells us that we’ve been trying to restrict activity in our patients with liver and spleen injury for no good reason. And this applies especially to the children. Look at your own clinical experience, and try to recount how many “failures” you’ve seen due to failure to follow activity restrictions. More typically, failures are due to undiagnosed or untreated pseudoaneurysms. It’s time to rethink your solid organ management protocol, if you haven’t already. 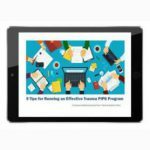 Do you really need a period of NPO status? Or bedrest? Or activity restriction? And have you ever tried to restrict activity in a 6-year old? Have a look at the guideline we’ve used at my hospital for nearly 20 years! We got rid of the NPO and bedrest restrictions a while ago. Now it’s time to start reducing the activity restrictions! Isolated Spleen or Liver Injury. J Ped Surg 35(2):164-169, 2000. Adherence to APSA activity restriction guidelines and 60-day clinical outcomes for pediatric blunt liver and splenic injuries (BLSI). J Ped Surg in Press, 2018. There is a significant amount of variation in the management of pediatric solid organ injury. This is well documented between adult and pediatric trauma centers in t, but also apparently between centers in different countries. A poster from a Japanese group in Okinawa Japan will be presented this week detailing the relationship between contrast extravasation after spleen or liver injury and pseudoaneurysm formation. In adults, the general rule is that pseudoaneurysms just about anywhere slowly enlarge and eventually rupture. This group sought to define this relationship in the pediatric age group. They performed a multi-center observational study of retrospectively enrolled children, defined as age 16 and less. Those who had contrast extravasation on initial CT were monitored for later pseudoaneurysm formation. Bottom line: This is an abstract, so a lot is missing. What was the age distribution, especially among those who underwent angiography? Was the data skewed by a predominantly teenage population, whose organs behave more like adults? The abstract answers a question but ignores the clinical significance. For those trauma professionals who routinely care for pediatric patients, you know that contrast extravasation in children doesn’t act like its adult counterpart. Kids seldom decompensate, and for those who are mistakenly taken for angiography, the extravasation is frequently gone. The authors even admitted in the conclusion that aggressive screening and treatment for pseudoaneurysm was carried out. The real question is, what is the significance of a solid organ pseudoaneurysm in children? Based on my clinical experience and reading of the US literature, not much. Of course, there is a gray zone as children move into adulthood in the early to mid-teens. But this does not warrant re-scanning and there should be no routine angiography in this age group. 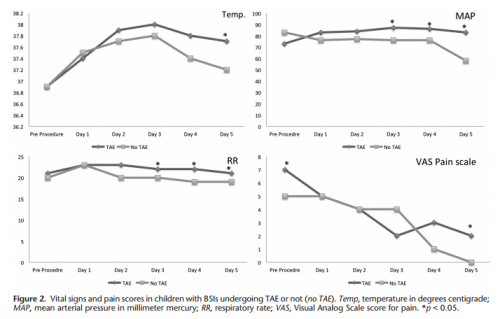 Contrast extravasation in pediatric patients warrants close observation for a period of time. But intervention should only be considered in those who behave clinically like they have ongoing bleeding. Reference: Association between contrast extravasation on CT scan and pseudoaneurysm in pediatric blunt splenic and hepatic injury: a multi-institutional observational study. Poster 31, AAST 2018. Do Children With Low Grade Solid Organ Injury Need To Transfer To A Pediatric Trauma Center? Pediatric trauma centers have an excellent reputation when it comes to caring for children when compared to their adult counterparts. Overall mortality for major trauma is lower. Splenectomy rates and the use of angiography are less in children with solid organ injury. And because of this expertise, it is common for surrounding trauma centers of all levels transfer these patients to the nearest pediatric trauma center. But is this always necessary? Many of these children have relatively minor injury, and the pediatric trauma centers can be few and far between unless you are on one of the coasts. Researchers at the University of Washington, Harborview, and Seattle Children’s looked at their experience with pediatric transfers (or lack thereof) with spleen injury. They retrospectively looked at 15 years of transfer data. The Seattle hospitals are the catchment area for a huge geographic area in the northwest, and the state trauma system maintains detailed records on all transfers to a higher level of care. Patients 16 years or younger with low grade (I-III) spleen injury were included. In an effort to narrow the focus to relatively isolated spleen injury, patients were excluded if they had moderate injuries in other AIS body regions. Bottom line: Injured children tend to do well, regardless of where they are treated. This study is huge and retrospective, which can cause analysis problems. And even given the size, the total number eligible for the study was relatively small. But it is the best study to date that shows that it is possible to treat select low grade injuries at non-pediatric, non-high level trauma centers. However, before going down this path, it is extremely important to define specific “safe” injuries to manage, and to have an escape valve available in case the patient takes an unexpected turn. 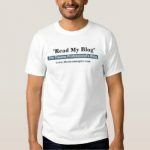 A reader requested that I write about post-embolization syndrome. Not being an oncologist or oncologic surgeon, I honestly had never heard about this before, let alone in trauma care. So I figured I would read up and share. 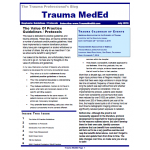 And fortunately it was easy; there’s all of one paper about it in the trauma literature. Post-embolization syndrome is a constellation of symptoms including pain, fever, nausea, and ileus that occurs after angio-embolization of the liver or spleen. There are reports that it is a common occurrence (60-80%) in patients being treated for cancer, and there are a few papers describing it in patients with splenic aneurysm. But only one for trauma. Children’s Hospital of Boston / Harvard Medical School retrospectively reviewed 12 years of their pediatric trauma registry data. For every child with a spleen injury who underwent angio-embolization, they matched four others with the same grade of injury who did not. A total of 448 children with blunt splenic injury were identified, and (thankfully) only 11 underwent angio-embolization. Nine had ongoing bleeding despite resuscitation, and two had developed splenic pseudoaneursyms. More of the children who underwent embolization had extravasation seen initially and required more blood products. They also had longer ICU (3 vs 1 day) and hospital stays (8 vs 5 days). Not surprising, as that is why they had the procedure. Bottom line: Sorry, but I’m not convinced. Yes, I have observed increased pain and temperature elevations in patients who have been embolized. Some have also had an ileus, but it’s difficult to say if that’s from the procedure or other injuries. And this very small series just doesn’t have enough power to convince me of any clinically significant differences in injured children. Look at the results above. “Significant” differences were only identified on a few select days, but not on the same days across charts. And although the authors may have demonstrated statistical differences, are they clinically relevant? Is a respiratory rate of 22 different from 18? A temp of 37.8 vs 37.2? I don’t think so. And length of stay does not reveal anything because the time in the ICU or hospital is completely dependent on the whims of the surgeon. I agree that post-embolization syndrome exists in cancer patients. But the findings in trauma patients are too nondescript. They just don’t stand out well enough on their own for me to consider them a real syndrome. As a trauma professional, be aware that your patient probably will experience more pain over the affected organ for a few days, and they will be slow to resume their diet. But other than supportive care and patience, nothing special need be done. Bedrest after pediatric solid organ injury? Really? case-control study. J Trauma 73(6):1558-1563, 2012.